I am on such a soup kick lately and just can't get enough! I saw a unique Black Bean Soup recipe from Dave Lieberman on Food Network that had Worcestershire sauce and ketchup in it and had to create my own version. This recipe is so easy to make and super quick. I was quite pleased with the results and hope you will be too! Pulse black beans in Cuisinart or blender until roughly chopped. In a medium dutch oven or soup pot, heat olive oil over medium high heat and add onion. Sauté until onions are translucent, approx 5-8 min. Add chili powder and stir for a minute until fragrant. Add black beans, ketchup, Worcestershire sauce, tomato paste, green chiles, chicken stock, salt & pepper. Cook over medium high heat until thoroughly heated (approx 10 minutes). Remove from heat and blend soup until smooth with a hand blender or regular blender. If soup is too thick, add more chicken stock and blend to the desired consistency. Serve with a dollop of greek yogurt and a sprinkle of chopped cilantro. Enjoy! 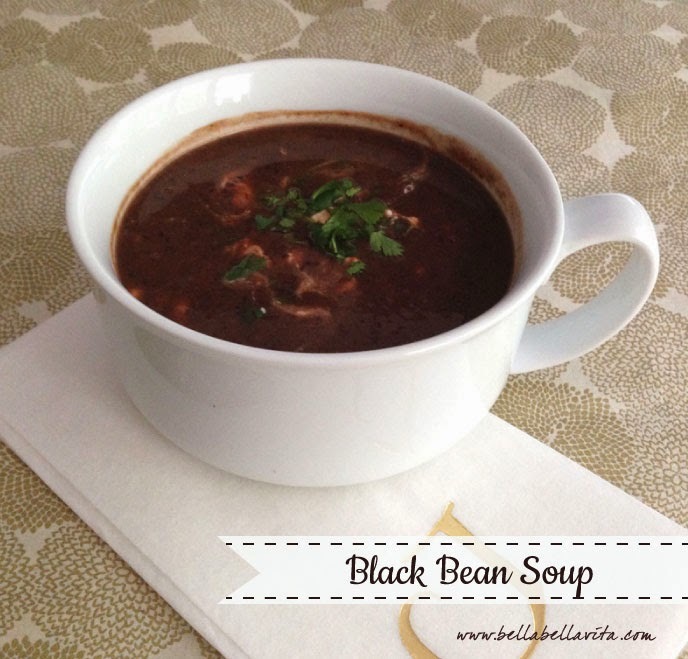 Don't miss my other soup recipe posts .... they're all low-fat and yummy!